My sister on a bike! Hooray! 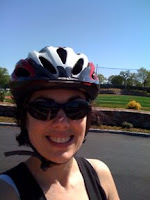 After I don't know how many years of encouraging my sister to get on a bike for fun and exercise, she's finally at it. She's had a nice bike for over a year now (a great first step! ), and now she's actually hit the road. Go Amy go! 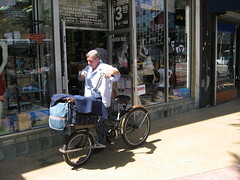 We spotted a few cycling postmen in Miami Beach last week. Interesting steel utility bikes with smaller front wheels. No helmets on the postmen, but I also didn't see any of them actually riding! Because we have family in Maine and travel to the region several times a year, I've been on the lookout for a compendium of good Maine bike routes. I've scoured the internet, looked a few books, but came up pretty much dry. I was sure there would be marked trails, like ones I've seen in Vermont, but I wasn't able to find anything at all. I started thinking about this because of relatives in Skowhegan, with the ambitious goal of cycling the 300-odd miles from Boston later this summer. But a recommended route? I was left high and dry. The routes are primarily along the coast, with a high concentration in the southern end of the state. Perfect for me! It didn't make any sense that they would have produced this and kept it a complete secret, so I set about searching the web again, and finally came to Explore Maine - By Bike on the state's official website. It seems to have all the same content in downloadable PDF format, though it's really hard to find and substantially less than straightforward to navigate. Kennebec River: This hilly and scenic gem winds through the historically important Kennebec River Valley and features a mix of agricultural and rugged mountainous terrain. Waterville-China Lakes: Challenging hills and excellent views make this tour a 3-season pleaser as it traverses the China Lakes region with its ridge views and charming villages. How exciting! I just can't believe how poorly Maine has publicized all this!